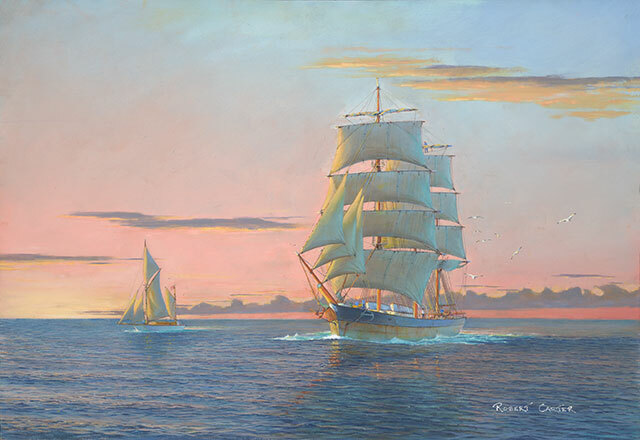 The barque White Pine makes landfall off the Grey River, New Zealand on her 76th crossing of the Tasman Sea and the end of her sailing career. It was 1922. She was the last of a fleet of sailing ships that traded between Australia and New Zealand. 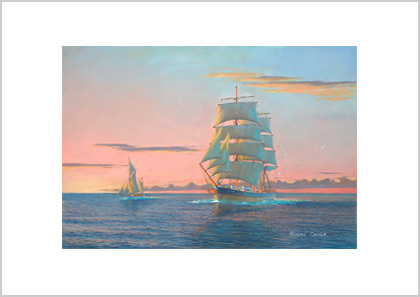 She was a fast sailer and once made the crossing in 7 days. This iron hulled vessel was built in 1879 for the Natal trade with Great Britain. She was named Quathlamba after the mountain range in South Africa which was later renamed Drakensberg. Auckland shipowner J.J. Craig bought her in 1899 and renamed her Hazel Craig after one of his daughters. She usually carried white pine to Australia, returning with coal loaded at Newcastle. In 1917 Craig sold her to a Captain Proctor who named her after the timber she usually carried. 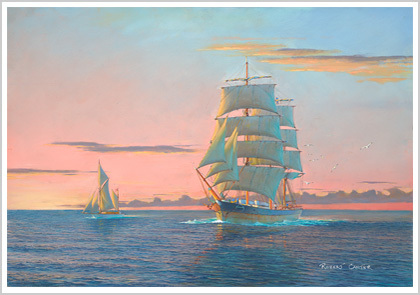 This painting is named to describe the end of what would be her last commercial voyage. She had just completed a fast passage from Australia and with a fair wind and favourable tide was able to sail up the Grey River to her discharging berth in the fading light without the aid of a tug. White Pine was bought by James Patterson & Co. a lighterage company in Melbourne for use as a coal hulk. In 1947 she was towed to sea and sunk off Barwon Heads. Image: 40 x 58.5 (cm) / 23 x 15.75 (in) with a white border to allow for framing and matting. The barque White Pine makes landfall off the Grey River, New Zealand on her 76th crossing of the Tasman Sea and the end of her sailing career..